Denis E. Reen Civil War Collection Leads Fall Militaria Auction | Skinner Inc.
MARLBOROUGH, MA – October 21, 2015 – Skinner, Inc. will hold an auction of Historic Arms & Militaria on Friday, October 30th, at 4PM. The sale includes 326 lots of important militaria from the American Revolution through World War II. 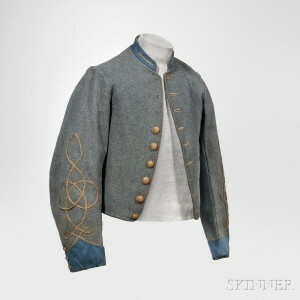 Items on offer include artillery, swords, pistols, powder horns, uniforms, muskets, and rifles featuring the very special Civil War collection of Denis E. Reen. A variety of late 18th and 19th century artillery from the collection of Fort Ticonderoga will be presented at auction including Spanish-American War Breech-loading Rifled Field Gun (Lot 25, Estimate $4,000-$6,000). Fort Ticonderoga was one of the earliest historic preservation projects begun in North America, and these pieces of artillery have been in the collection since the association was established in 1931. 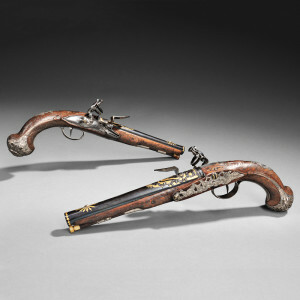 The auction also features pistols and muskets, historic documents, and antique arms from the American Revolution through World War II. Items include A Revolutionary War powder horn attributed to carver Jacob Gay evokes an important moment in early American history carved at the siege of Boston (Lot 114, Estimate $20,000-$25,000). Carved with the name “Peter Perit”, as well as wonderful scenes of soldiers dancing, fighting, Native Americans, and “Success To America.” Also in this auction are a Colt model 1851 Navy Revolver, presented to Louis T. Wigfall from General Joseph E. Johnston is a rare find (Lot 52, Estimate $10,000-$12,000) and a pair of silver-mounted Wilson flintlock pistols with wonderful silver wire inlays (Lot 33, $8,000-$10,000). Additionally, a selection of historic documents will be offered, including the Civil War letters and documents of James C. Duane, chief engineer of the Army of the Potomac (Lot 157, $5,000-$7,000). Previews for the auction will be held on Wednesday, October 28, from noon to 5 PM, Thursday, October 29, from noon to 7 PM, and Friday, October 30, from noon to 3:30 PM. An Illustrated catalog #2856M is available from the Subscription Department at 508-970-3240.The catalogue is also available at the gallery. 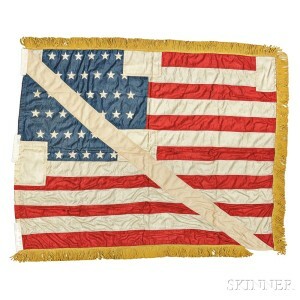 Prices realized will be available at www.skinnerinc.com during and after the sale. The Skinner website also enables users to view all lots in the auctions, leave bids, order catalogs and bid live, in real-time through SkinnerLive! This entry was posted in News and tagged antique arms, boston, carbines, Civil War, Confederate, Denis E. Reen, eagle pommel sword, firearms, Fort Ticonderoga, historic documents, Joel Bohy, Militaria, muskets, pistols, polearms, skinner, skinner auctions, swords, WWI, WWII by Skinner. Bookmark the permalink.